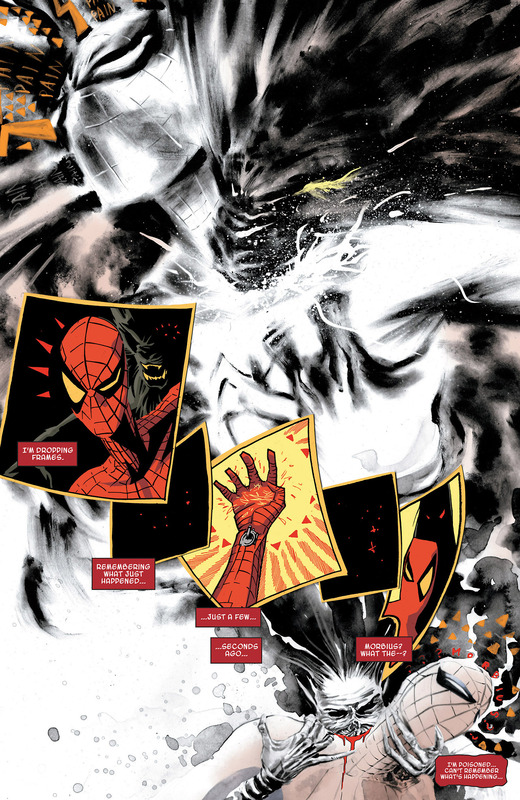 “Marvel Knights: Spider-Man: Fight Night” is not only a book featuring gorgeous art by Marco Rudy and colorist Val Staples, but also showcases a story by Matt Kindt that is unexpected in the most welcome ways. While reading, one can imagine Kindt, who is also an accomplished artist, interpreting this story in his equally gorgeous style. Yet that thought goes away quickly, with one hoping the artistic team of Kindt and Rudy join forces again for another trippy, poignant, and psychedelic tale to enthrall their readers. Peter Parker’s journey begins when he’s informed by the psychic Madame Web that he must solve ninety-nine problems or something truly horrible will occur. A routine photography job turns out to be anything but, leading Spider-Man on a journey through the dark corners of his mind. He not only faces his inner demons, but a plethora of the Marvel universe’s greatest (and not-so-greatest) foes. This is a Spidey story that will hit the reader over the head and go beyond what one would expect of a story featuring Marvel’s friendly neighborhood Spider-Man. Although Kindt’s dialogue and thought captions contain the trademark Spider-Man humor, a depth of character comes through in the sense of dread and disorientation that Peter feels and expresses throughout the book. As his adventures become more and more strange, Peter still (mostly) retains a centered mind and sense of hope. He reminisces about a particular camping trip with his Uncle Ben, which helps him persevere through the hell he is put through by his enemies. This is only one example of how Kindt doesn’t talk down to the reader or explain everything going on in the book, but instead allows Rudy to take a pretty simple story of a man’s descent into madness and construct it into a visual feast of emotions, mood, and style. Rudy, like his art in the “Swamp Thing” book, brings his unique style to this Spidey story. Although his style shines through, he adds something new and intriguing to the proceedings. The art changes and transforms as the reader travels from one scene to the next, bringing something visceral and animalistic to the descent of Peter Parker’s mind into possible psychosis. At times, one can see influences that Rudy must have borrowed and morphed into his own from other artists. Besides the clever use of video game-style art, humorous (yet also haunting) use of airplane survival manual-style art is peppered a few times throughout. 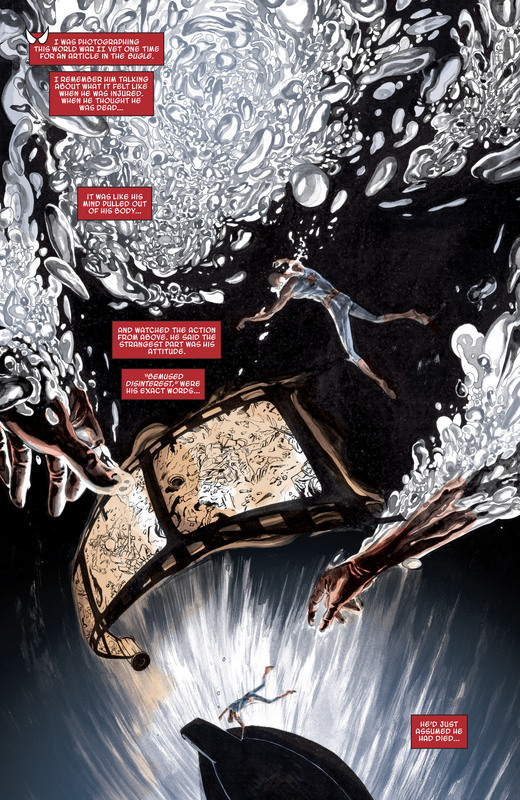 Artist Dave McKean’s influence can be seen at times (such as a “biting” scene with Morbius the vampire), with use of photography seeming to be evident on the page. On one amazing page with Frankenstein’s monster, artist Bernie Wrightson’s influence is definitely given an homage. The intricate linework and black and white sketchiness is proof enough. There’s even a little Alex Ross influence thrown in for good measure (and possibly more artistic tributes that this reviewer has missed while reading). Rudy doesn’t just steal influences. He has fun with them and seems to have been given free reign by Kindt to go wherever his artistic juices flowed. Morbius has quite a bite! Rudy doesn’t just have fun with the art. He also has fun with the layouts in the entire tale. Traditional panels are nowhere to be seen. There’s no room or reason for Rudy to have any scenes with “boxy” panels. The reader is delving into the drugged mind of a young superhero, so, naturally, Rudy must be creative in order to depict a story that doesn’t take place in the real world. He goes just as far with the layouts as he does with the art itself. The reader will get a feeling of actually being inside the mind of Peter Parker, with a sense of fluidity being the result of the artwork and layouts. There’s a sense that what is occurring cannot be grasped. By eliciting this feeling of disorientation, it demonstrates the genius of Rudy’s art and the sense of emotions that he can rip from the reader. While physically holding onto the book, it seems as if the reader will get sucked right into the story and into Peter’s mind. One particular scene is evidence of everyone involved in the creation of this book (writer, artist, colorist, and letterer) bringing their very best in making this a special tale. Peter reminisces about what a WWII veteran told him about war. The fighting was not the worst of it, according to the vet. It was “the anticipation. The not knowing.” When the page is turned, Spider-Man enemies Venom and Carnage begin to battle the old web-head in what turns out to be an intricate four-page battle. Spidey continues to tell the tale of the vet, saying, “Once the fighting began, instinct just took over. Carnage flowing through your blood…like venom” (which is a nice playful sentence). Kindt goes on to write about time slowing down and senses being enhanced. “Your mind stopped working…and your body with all its amazing senses…just took over.” The same can be said about Kindt’s story. Peter’s Spidey sense is of no use here. Every sense is expressed and experienced in this story, with no intricate plot needed. The fight to survive is the only pertinent battle in this “fight night.” Chaos ensues and must be tamed in order to survive. Like the fight itself, the art is chaotic and messy (in the only the best sense of the word). As Venom and Carnage battle Spider-Man, their bodies contort and stretch in unbelievable ways. Carnage pulls Spidey by the hand as his body plunges toward the reader, looking at us with one of his iconic Spidey “eyes”. The spider-webbing shoots out of Spider-Man’s wrist as a huge white spray with a big “SPLOOSH” sound effect. Venom attempts to punch Spidey, but instead punches the rudimentary outline of a Venom head that makes up the “panels” of the fight on one page. This scene is just an example of Rudy’s inventiveness, with him showing his ability to convey mood, emotion, and one hell of a fight (which is one among many). One cannot mention the beauty of this scene (and the book as a whole) without giving credit to colorist Val Staples and letterer Clayton Cowles. Words are integrated throughout the art here and elsewhere, with “Kill you slow, eat your brain” being weaved within the fight. Whether that was Rudy’s or Cowles’ idea, it adds to the insanity of the book when being used here or elsewhere. The boxy “KLANG”s that fill the background of the fight is also done in such a way that it contributes to a sense of not being in one’s right mind. Staples’ colors are superb here and are evidence of how adept he is at coloring the many styles of art that Rudy adopts throughout the book. Black and white, bright reds and yellows are used to assault the reader in this scene. Staples is integral to this scene and the book as whole. He is just as integral as Marco Rudy in making this Spider-Man book as gorgeous, insane, highly emotional, and complex as it is from beginning to end. This is a book that can be read more than once, with the art so detailed and varied, that something new can be gleaned from it after each reading. Matt Kindt’s story is not as intricate as some of his creator-owned work, yet it also is not your usual superhero fare. It’s not even what you would expect from a Spider-Man tale. He takes Peter Parker to dark places and has more than capable artists in Marco Rudy and Val Staples in order to express this story in a beautifully deranged and maniacal way. This “fight night” is not only a battle between Spider-Man’s physical enemies, but against the dark demons that reside in Peter Parker.